There's some truth to the notion that the most secure lock is the one you can't even find - if you don't even know where to start, picking it becomes practically impossible! 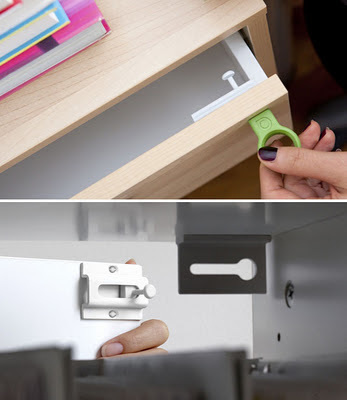 That's why I like the "Covert" invisible magnetic drawer lock from Quirky - it's not just a clean minimalist design, it's even more effective than normal locks. The only problem with this kind of product is that it relies on its secret for its effectiveness - so if the product ever becomes too popular, it'll essentially stop working!